We retained three of the prior six priorities: providing the highest quality care, delivering on a great patient experience, and advancing our role as a physician organization fully integrated into Northwell Health. We also adopted three new priorities: improving the ease of connecting patients to our providers, promoting the coordination of care by preferentially referring our patients to each other instead of to outside providers, and making sure that we take care of our physicians as well as our patients. • Physicians want and need a well-functioning work environment in order to feel better about the work they do and the care they deliver – the same things that will benefit patients. 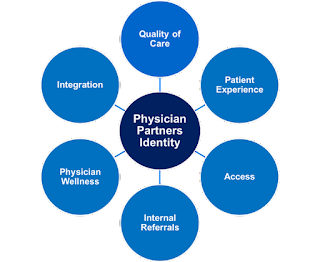 Tying it all together, we need to make real improvements in how we organize and deliver care, in order to make it better for our patients and physicians. That is pretty easy to articulate, but hard to deliver, and is the work ahead.